Leading Egyptian Rapper and Music Producer, Abyusif and the Talented Musician, Islam Chipsy came together for a long-awaited promising collab. With their latest song ‘Ana Mesh Ha2adar 7ad’! Apparently, things went even better than expected, in about ten days, the song garnered more than 2.3 million views on Facebook alone! The very well made music video, Abyu’s awesome lyrics, Chipsy’s lit music, and the participation of the Legendary Shabaan Abdelrehim, all made the song go super viral! Everyone was betting that we’ll see a concert combining the two artists soon, and it’s happening! 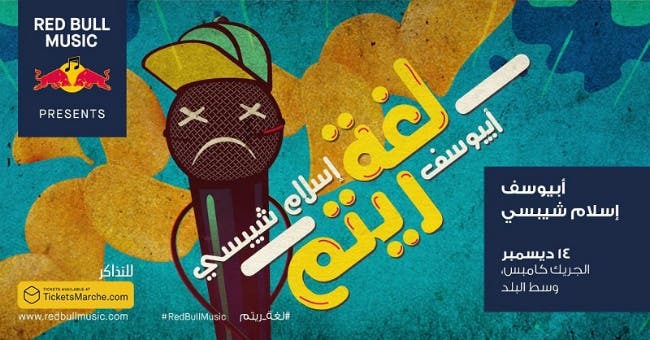 Red Bull Music announced that they’re hosting the two artists in the AUC’s Greek Campus this month. Logharetm will take place on the 14th of December, at 6:00 PM, and the ticket is only for EGP75! You can book your tickets from Ticketsmarche and you can click here for more information. Although it wasn’t announced, everyone is pretty sure that Sha3bola will make an appearance at the concert.